Whatever happens the rest of the way, the 2017 North Carolina A&T team etched its name in stone Saturday against Norfolk State. 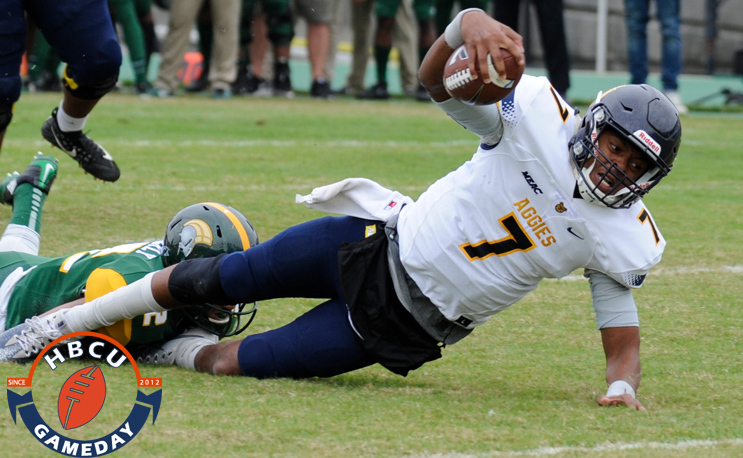 A&T’s 35-7 win over NSU marked the first time in the program’s 93-year history that it has gone 9-0. “It’s special, but it’s not quite good enough,” A&T coach Rod Broadway said. “We’ve got to go 10-0. “Nine-and-oh is special, but when you’re chasing excellence that’s a different ballgame. And I’m talking about going 11-0, I’m talking about the we way play. I want to see us play closer to our potential level than we do at times. Quarterback Lamar Raynard wrote himself into the Aggie history books as well. The High Point, NC native broke Maseo Bolin’s 22-year-old school record for passing yards in the win. Raynard passed for 277 yards in the win and rushed for two touchdowns as well. He has 2,302 yards on the season with two more regular-season games and likely at least one in the postseason. Raynard’s first quarter TD run from one yard out gave A&T its first score, and Jeremy Taylor’s pick six gave it a 14-0 lead. NSU would respond with an eight-yard touchdown pass from Juwan Carter to Isaiah Winstead to cut the lead to seven, but that would be as close as NSU would get. A&T held NSU to just 45 yards of total offense in the second half, using three one-yard runs to come away with the 28-point victory. With Hampton’s loss to North Carolina Central, A&T can wrap up at least a share of the MEAC title for the third time in four seasons with a win over Savannah State next week, and a loss by either NCCU or Howard would guarantee A&T the sole MEAC title for the first time in over a decade next week. Question is do they go to the Celebration bowl or the playoffs?